Roughly 60% of companies operating in the cannabis industry don’t have bank accounts for their businesses, according to first-of-its-kind data from a survey conducted by Marijuana Business Daily. The situation is even worse for companies that actually handle the plant, with 70% reporting that they’re currently operating without traditional banking services. 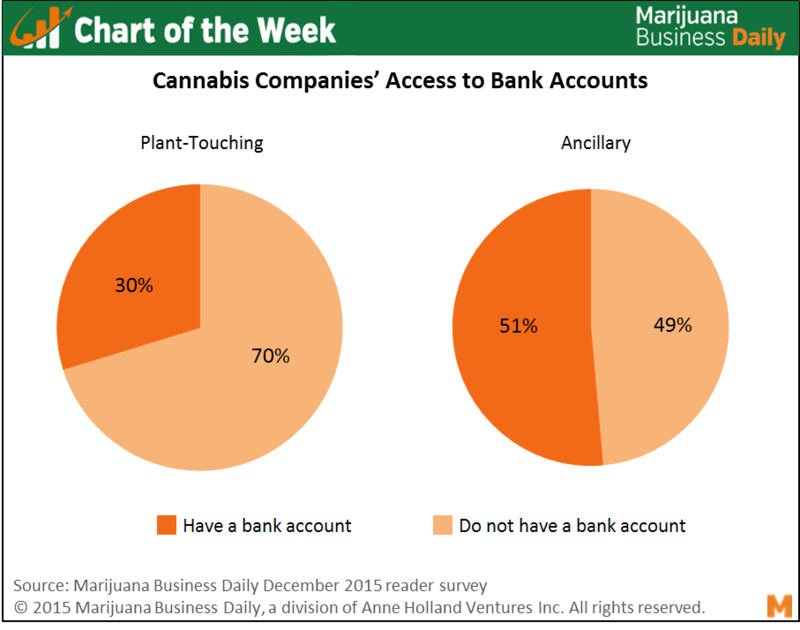 The poll, which includes the responses of over 400 cannabis professionals from across the country, also found that a surprising 49% of ancillary firms don’t have bank accounts. This underscores how difficult the situation is even for companies that don’t touch marijuana, such as consultancies, software providers and other firms that sell products and services to the industry or cannabis consumers. While the industry’s banking problems are well known, there has been little data or research on the issue of how many companies are operating with banking relationships. Among the plant-touching industry sectors, wholesale cultivation companies have the lowest rate of access to the financial system – 81% of these businesses don’t currently have basic services such as a checking account. The circumstances for infused products makers and MMJ dispensary/rec store retailers are somewhat rosier by comparison, but 68% and 54% of those businesses, respectively, nevertheless still don’t have bank accounts. Nearly 30% of companies without a bank account report they are actively seeking one, and another 13% are not currently pursuing one but have tried to in the past. That being said, persistence does seem to pay off. Of the businesses that currently have an account, 29% previously had other accounts closed by a bank. That’s more than twice the portion of businesses without banking services currently that previously faced account closures. “Over the past six years I have had 14 accounts closed for the business,” said Tim Cullen, CEO of Colorado Harvest Company, which operates several cannabis retail shops and grows and currently has a business checking account. Cullen went on to say that the process of obtaining the company’s current account was more time consuming and difficult than getting local and state licenses to operate the business. “[Anything] and everything that the business has done in a financial sense as well as detailed personal history of the owners and their spouses” was required to get a bank account, he said. However, a checking account still doesn’t allow a business to process card payments or finance equipment or real estate, posing major ongoing challenges to daily operations and strategic growth. Finally, even if cannabis professionals are able to eventually secure any/all banking services for their businesses, they still face the prospect of having personal accounts closed. All of that being said, many within the industry believe the full repeal of prohibition, and thus resolution of this particular issue, is closer than ever. Until that happens though, cannabis businesses will continue to lend new meaning to the term “tenacity” as they build successful enterprises in the face of this lofty challenge. The industry needs it’s own bank. We should build our own means of assisting each other without including the Federal Government or their desire to know all about you. All business may need to be done outside of the country where their laws work with us. HSBC took billions in cash from cocaine cartels with no penalties. We want to work with the system and they should make an easy transitional pathway so we dont end up having to start our own banking system and threaten the status quo. I am looking for a bank to have a checking account. We are a new cultivation facility here in Colorado. I would appreciate any leads? thank you. Banking is about relationships and trust. The typical bank customer does not walk through the door every day with a 5-figure cash deposit. This is suspicious activity and it makes bankers nervous because they have to report it. They have no idea how huge the market is. All this cash is unprecedented. It’s beyond their understanding. My own experience with bankers suggests you should open your books and educate them with your business plan, sales projections, cash forecast, balance sheet. Show them your monthly income statement, give them a copy of your tax return. In other words, give them numbers they know and understand and build a relationship. Meet with them on a regular basis. Get them invested in your business. Bankers are always on the lookout for good long-term customers. They want you to succeed. Show them you mean business. @Vito it’s a serious problem. we’ve had opportunities to do *exactly* what you believe is the best course of action, but short of only working with local 1-branch banks, we’ve still had issues with seeing past accounts being force-shut-down, with the instruction to do so passed down from an anonymous “upper management” committee. at least, that’s been the experience here in CA. Why not contact Elon Musk and his partner at ” Pay Pal ” to start a new bank for Cannabis growers and sellers ? I’m not a banker but this seems like an opportunity someone to start a special bank for the growers and sellers, it is estimated to be $10 billion dollar and up the first year alone. Why not bypass “traditional” banking sources altogether! Form & create co-op blockchain(s) – cryptocurrency (ies). The requisites to establish relationships of “trust” with traditional banks exist within the blockchain-cryptocurrency evolving universe, and for MJ Entrepreneurs. The fodder cash is there to start. MOVE your monies to your-own-accommodating-system(s). Many companies/entities are accepting cryptocurrency as currency; many-more-will. Future wise with the present political US Zeitgeist, the USD will take a dive – IMO. Stop looking harder in the same “traditional” directions – expecting change or acceptance. It’s like asking for f’n permission – from a old fogey parent! Threaten (and change) the status quo. You got money. You got power! Thank me later AND let’s suit up!